All other extraordinary characteristics result from that difference which only at first sight appears small. Higher flow velocity and/or smaller pebble diameters may be used, as there is no danger of fluidization. That provides a very high specific surface (or surface to volume ratio) and consequently an excellent heat transfer. A thermal efficiency of 95 % has easily been achieved (without any additional off-gas recuperation for preheating combustion air or gas). A unit with a recuperation rate of over 98 % is already in operation. 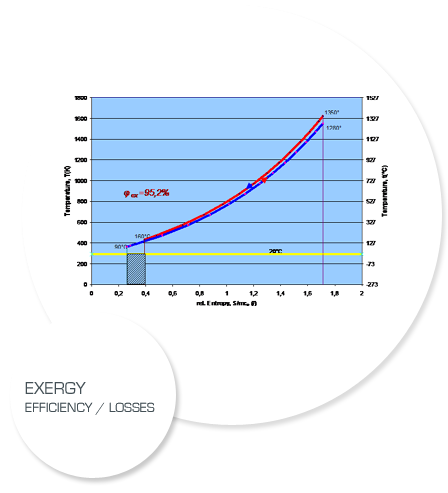 In addition, those results are achieved at small exergy losses, i.e. with low temperature difference (as little as 20 K) between heating and heated gas - and all that at temperatures of up to 1,500°C. Due to the excellent heat transfer, a thin pebble bed (temperature gradient of 2,000 K/m) is sufficient in a low or acceptable pressure drop. In the end, that leads to a very compact unit with the most important characteristics for every investor: low investment costs. The Pebble-Heater consists of a cylindrical vessel with two permeable grids and a pebble bed between them. The inner grid, the so-called hot grid, is made of high quality ceramic bricks (almost pure Al2O3) with honeycomb segments set in to prevent the movement of the pebbles. The present design was tested up to 1,500°C in a pilot facility (PH 104) and in a laboratory furnace. With improved honeycomb segment quality, it is believed to sustain even higher temperatures, up to 1,700°C, which could be of interest for some special applications. The outer grid, the so-called cold grid, is made of a gas permeable steel construction (e. g. perforated steel plate). The pebble bed is fixed between those two grids, so that there is no possibility for it to fluidize or circulate. The maximal temperature at the cold grid is an important design parameter. It is usually held under 250°C. However, the mean value of the cold grid temperature is considerably lower. That means the outer shell can be constructed out of conventional steel. There is not any need for an outside insulation. Indeed, fire-clay elements are only required on the top of the hot grid (so-called dome) and at the bottom, around the hot gas inlet/outlet. For high temperature applications, the pebble bed consists of alumina pebbles. They can sustain extremely high temperature cycling (even over 400 K) without any damage. For less demanding applications other bulk materials may be used, such as fire-clay balls or even river gravels. As shown in Figure, the hot grid together with the dome may expand upwards freely. That eliminates all sealing problems between metal and ceramic parts. Moreover the hot grid stays free of stress. 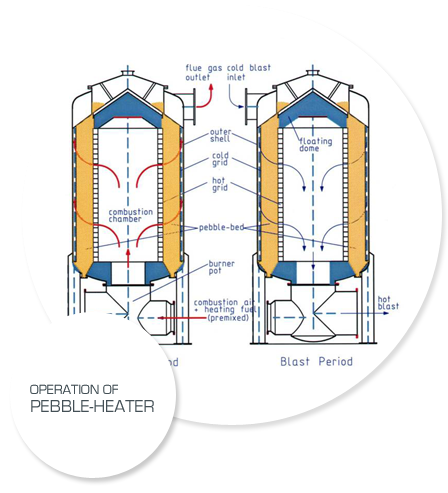 The Pebble-Heater is a regenerative heat exchanger, which means at least two units are required for a continuous flow. While one is in the heating phase, the other produces hot gas. After a certain period of time, they will switch and exchange their phases of operation. Figure 1 explains the operation of the Pebble-Heater during those two phases. The combustion chamber is placed inside the hot grid. The premix burner is using combustion gas with high (natural gas) or low (BFG) heat value. During the heating phase, the mixture of combustion air and fuel enters the burner pot and ignites. Due to good premixing, the flame is very short and without temperature peaks. Combustion products enter the pebble bed through the hot grid. When reheating the bed, flue gases are cooled down and leave it at a low temperature. They pass upwards through the distributing gap between the cold grid and the outer shell and exit the heater toward a stack. When the Pebble-Heater is reheated, the burner stops and, after pressurizing, the cold blast enters in reversed direction. It is distributed around the pebble bed and passes through it. During that "blowing phase", the heat is transferred in opposite direction, from the pebbles to the gas phase. The hot blast is collected in the combustion chamber and leaves the Pebble-Heater through the hot blast main. Instead of combustion products, some hot gas may be used during the heating phase. In that case, the Pebble-Heater recuperates the waste heat from that gas for preheating air or some other gas. The temperature profile inside the bed is S-shaped. That is a very important and extraordinary characteristic of the Pebble-Heater. It is the result of intensive heat transfer and consequently a low temperature difference between gas and pebbles. While the pebbles in the middle of the pebble bed experience a temperature change of 400 K, the hot grid always stays at a high temperature. The hot blast temperature stays constant during two thirds of the blast period. Only during the last third of the blast period this temperature has a somewhat more intensive drop (ΔT = 20-100 K, depending on design requirements and operational conditions). The temperature changes on the cold grid are also relatively small (ΔT = 100-150 K), which results in a low average temperature of the flue gas and thus a low exit loss.